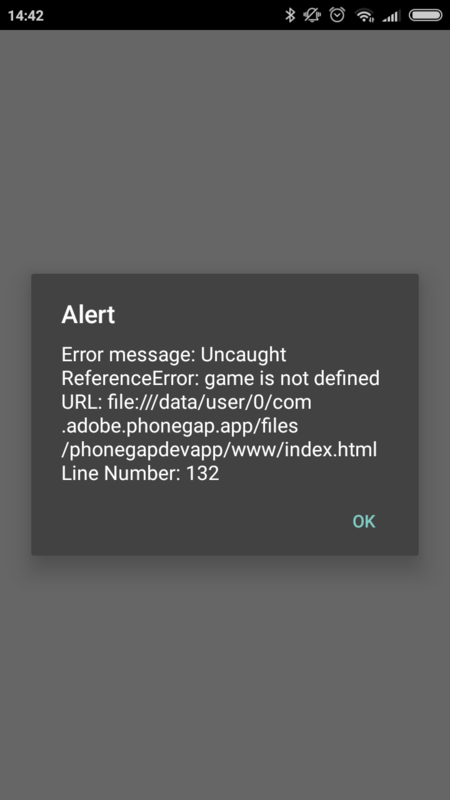 I haven't used phonegap, but either there is an error in your game.js or the script tag for game.js has not been loaded. Make sure that game.js is imported and valid before you call game.onLoad(). Does it provide a console where you can see other errors? It could be that the game.js file is not loaded. Does it provide a console where you can see o﻿ther errors? It could be that the game.js file is not loaded. it does not provide console on phonegap andorid, so i need to user alert window to catch error. Usually browsers load files sequentially, so the file should be imported before you call game.onload(). It might be that you need to declare resources elsewhere. If you feel like taking the extreme approach (somewhat sloppy) you might try just pasting everything into one huge inline script tag. My advice would be to review the phonegap manual first. I believe there is also an opensource alternative to phonegap now. You might have better results with that.